The film opens with Colonel Sam Trautman (Richard Crenna) returning to Thailand to once again enlist the help of Vietnam veteran John J. Rambo (Sylvester Stallone) whom has settled in the country since the events of First Blood Part 2. 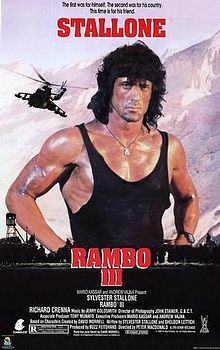 After witnessing Rambo's victory in a stick fighting match, Trautman visits the construction site of the Buddhist temple Rambo is helping to build and asks Rambo to join him on a mission to Afghanistan. The mission is meant to supply weapons, including FIM-92 Stinger missiles, to Afghan rebels, the Mujahideen, who are fighting the Soviets in the Soviet-Afghan War. Despite showing him photos of civilians suffering under Soviet military intervention, Rambo refuses and Trautman chooses to go on his own. While in Afghanistan, Trautman's troops are ambushed by Soviet troops while passing through the mountains at night. Trautman is imprisoned in a Soviet base and coerced for information by Colonel Zaysen (Marc de Jonge) and his henchman Kourov (Randy Raney). Rambo learns of the incident from embassy field officer Robert Griggs (Kurtwood Smith) and convinces Griggs to take him through an unofficial operation, despite Grigg's warning that the U.S. government will deny any knowledge of his actions if killed or caught. Rambo immediately flies to Peshawar, Pakistan where he meets up with Mousa Ghanin (Sasson Gabai), a weapons supplier who agrees to take him to Khost, a village deep in the Afghan desert, after Rambo threatens him, close to the Soviet base where Trautman is kept enslaved. The Mujahideen in the village, led by the village's main leader Masoud (Spiros Focas), are already hesitant to help Rambo in the first place, but are definitely convinced not to help him when their village is attacked by Soviet helicopters after one of Mousa's shop assistants has informed the Soviets of Rambo's presence. Rambo shows his fighting skills when he mans a 12.7 mm heavy machine gun and uses it to shoot down one Soviet helicopter.